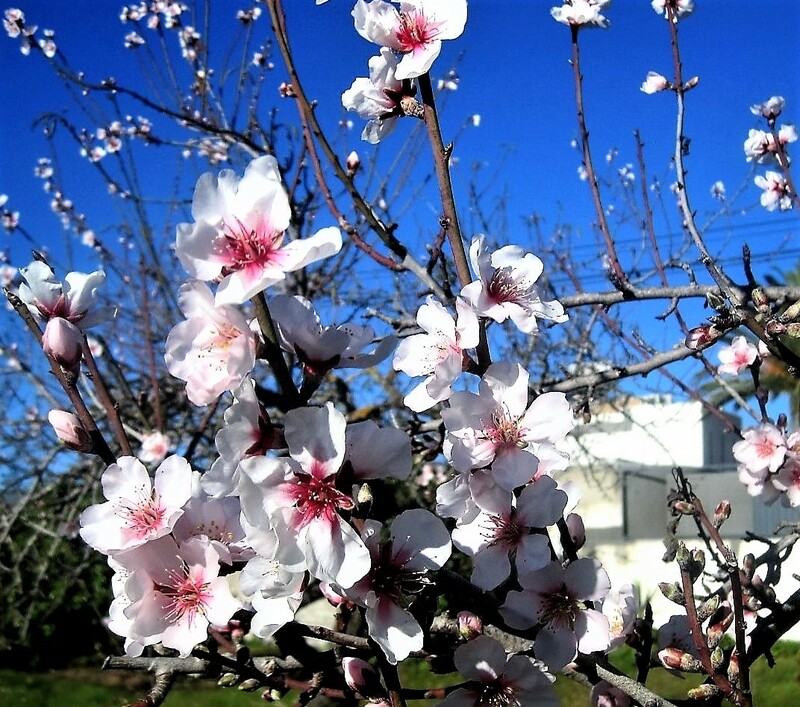 As promised, almond blossom in the Algarve this week. This is a variation on a walk we’ve done previously, this time starting in the small seaside town of Fuseta. It’s just a few stops west of Tavira by train. Wave your passport at the conductor and you’ll get half fare if you’re a pensioner. Well, there have to be some advantages to being over the hill! Not too many hills this near to the coast, but it’s up and over the railway tracks and out into the countryside. 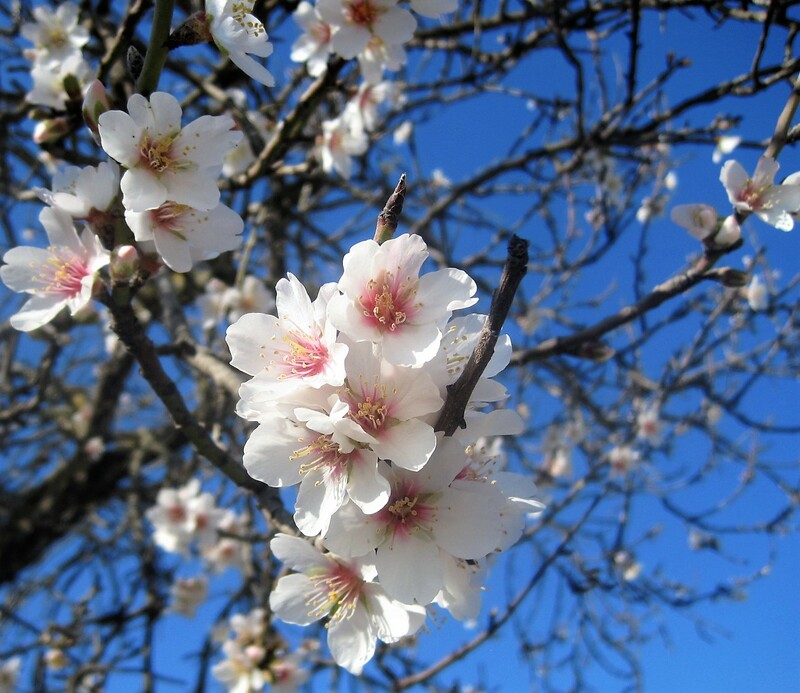 We’ve barely taken a few steps when we’re in a field, surrounded by almond blossom. I stand and stare! Blossom is opening up in trees all along the roadside, but this is the first time I’ve seen the flowers out in such force. I can’t understand how my walking friends can be so oblivious of their surroundings, and I linger far behind. Maybe it’s the lure of a coffee stop up ahead. On they go, following a path through the fields, a glimpse of sea shimmering on the horizon. Soon we’re on a paved lane, leading to the E125- a busy road which stretches almost end to end of the Algarve. We are making a stop at Tianica, a pottery workshop with a cafe and terrace at the rear. Avoiding temptation in order to have space for lunch, it’s back to the lane after coffee. A track leads down to the edge of the salt marshes and we follow it back in the direction of Fuseta. The tide is low, and boats sit silently in the sludge, waiting to be rescued when it turns. It’s not a long walk, though you can extend it further through the marshes, which continue on the far side of town. We thread between the fishermen’s cottages and the apartment blocks, and I’m delighted to find remnants of Christmas in the yarn bombed trees. Go on, admit it! You’re more interested in lunch. A leisurely affair at La Plage, on the front at Fuseta, culminating in cake, of course. I stood in line at the cabinet, hopeful that there’d be a morsel of tiramisu left. I must have looked desperate, because the waiter served me the last slice and then added a scoop of profiterole to my plate. Lucky, or what? Totally replete, I sat by the waterside afterwards, keeping a lazy eye on life. Finally I persuaded myself to stir in the direction of home. Short but sweet, I hope? I bet you enjoyed the cake. Got a walk you’d like to share? Join me here on Jo’s Monday walk for a warm welcome. Brian takes us to subtropical community gardens for a little heat. Want to join him? That’s it for another week. Please find time to read them. I shall be out and about, as usual. Hope the weather’s kind, wherever you are.